South Carolina is making its seventh super regional appearance in the last eight years. The Gamecocks swept through their Columbia Regional, beating Wofford and then Charlotte twice. North Carolina, the #3 national seed, swept through the Chapel Hill Regional, knocking off Jacksonville, East Carolina, and Western Carolina to make their second straight super appearance. This is the second time these teams have faced off in a super regional, as the Gamecocks took two from the Heels in Columbia four years ago to reach Omaha. This is the first time Boshamer Stadium has hosted a super regional, and it�s a pretty good way for the old stadium to go out. It�s been a fine home for the Tar Heels, as they�re 34-7 in the friendly confines this season. In the past three seasons, UNC is 104-16-1 at home. Not bad, eh? South Carolina�s likely rotation will consist of Harris Honeycutt (8-5), Arik Hempy (6-3), and Mike Cisco (6-2). For North Carolina, the trio looks to be Robert Woodard (10-2), Alex White (6-4), and Luke Putkonen (7-1). When they�re on, each team�s trio can be among the best in the country. The Gamecocks are known for offense, and that�s the case this year. They lead the nation with 110 homers, led by Justin Smoak (21), Travis Jones and James Darnell (18), and Phil Disher (15). 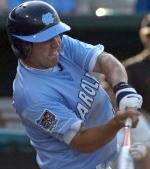 North Carolina�s offensive numbers aren�t shabby, as the Tar Heels are hitting .322 as a team with 64 homers. They�re led at the plate by freshman Dustin Ackley and his .427 average and 65 RBI. The edge here has to go to South Carolina though, due to their impressive power ability. South Carolina has a number of arms to go to in the pen, with Curtin Johnson, Jeff Jeffords, Will Atwood, and Wynn Pelzer all logging over 20 appearances this season. But North Carolina has the edge here with stud closer Andrew Carignan (1.53 ERA, 14 saves), and star relievers Rob Wooten (5-1, 2.38, 38 apps.) and Matt Danford (5-0, 2.60). Ray Tanner has turned South Carolina into one of the top baseball programs in the nation, leading USC to now seven super regionals and three College World Series appearances, including a runner-up finish in 2002. Mike Fox has built a pretty solid program in Chapel Hill, leading the Tar Heels to a runner-up finish in Omaha last year, and eight 40+ win seasons. UNC�s a tough customer at Boshamer Stadium, but the Gamecocks play well on the road. This is the last weekend for the old Boshamer Stadium, so there�s a lot at stake, along with the obvious implications of the series. Ray Tanner has a wealth of postseason experience in Columbia, but a lot of the current bunch of Gamecocks haven�t made it to Omaha, and they�re no doubt hungry to do just that. While UNC is looking to take last year�s finish a step further, USC is looking for a return to their summer home from 2002-2004. And, in case you didn�t know already, it�s North Carolina-South Carolina. �Nuff said. For baseball fans in the Carolinas, this is a dream matchup. North Carolina no doubt wants to close out Boshamer Stadium in style, but South Carolina will have other plans. The key for USC is to get solid performances out of their rotation, which has been a little shaky at times. If the pitching matchups come out as even as they are on paper, South Carolina�s hitting could power them to Omaha. But if the games come down to the final innings, the Tar Heel bullpen has the ability to shut down USC's potent offense. Getting to UNC�s rotation early would be huge for South Carolina to have a chance this weekend, but it won�t be easy. It looks like this should be a close series, and don�t be surprised if it comes down to the end in a third game.